A legendary pre-match watering hole and there is certainly bags of character. The shtick is Indian food of high quality (the Chicken Tikka kebabs are divine) and while the ale selection is very limited, the Batham's Gold was in great condition and went down well. The one snag is how ludicrously busy the place is while veggie options, usually available, were absent on this visit. Service can also be brusque but there is an irony in seeing punters some of whom will have voted Leave in their droves tucking into the fruits of multicultural Britain with gusto. Lord knows how many people come here away from match day. Back ticking off the CAMRA Good Beer Guide Pubs... Opens at 5pm weekdays. Curry as good as ever. Bath Ales Prophecy in fine condition. We were back here on Boxing Day. I'd tried a number of other pubs in West Bromwich. But most I tried were closed. The Vine was as busy as usual on a matchday. The solitary real ale (Holden's Golden Glow) ran out just as I got there, which left a poor selection. It's just about the best pub nearest the Hawthorns. But I'm downgrading the score to a 4/10. Great vibe, good beer and curries. Mind you don't get lost in it. It's been a few years since I was last in here. But we paid a return visit on Monday evening. It seems even bigger than I remember it. There are a couple of small rooms at the front where the main bar is. These give way to a larger conservatory and then an even larger room where a barbecue takes place on matchdays. I can recommend the chicken tikka kebabs. Curries also looked tasty. Crowds spill out onto an outdoor patio beyond that, which also stretches down the side of the pub. 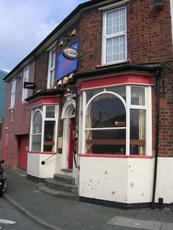 The pub caters for the masses on a matchday (West Bromwich Albion). But I would like to return one day on a non-matchday to see how it fairs. 2 real ales were on - Holdens Golden Glow & Ludlow Gold. Serves a purpose well.